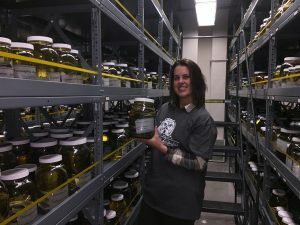 Erica Ely visiting the herpetology collection at the Museum of Vertebrate Zoology. Take our Quick Tour of the basic features of Arctos. Select all collections if you are interested in a broad search of Arctos, or narrow your search to specific collections by choosing the collection(s) on the main Search page. View the list of Arctos collections. Read about our Data Licensing and Use. Follow collection loan policies when requesting specimens or tissues. If you are only interested in tissues, be sure to check the “Require Tissues?” box.